These almond honey cakes came about as a result of a failed attempt at making almond nut butter. I will be posting about this and its serendipitous love child later this month. Suffice it to say, the end result was totally worth it. I used some of my nut butter to make these cakes, but have given a slightly easier method here so you don’t have to make my version of nut butter first. I was putting my new Optimum G2.3 platinum series induction blender* through its paces, but my trusty Optimum 9200A* would have worked equally well. The cakes, whilst not entirely sugar free, are made with a modest amount of honey and a small addition of crystallised ginger. As well as being low in sugar, they are low in fat too with only one tablespoon of coconut oil. The pears helped to sweeten the cakes, as well as giving them a nice texture. Almonds are always a good addition to a cake in my book. A little warming ginger combines beautifully with the other flavours and keeps the cockles of the heart glowing in the cold night air. If you like this recipe for easy gingered pear almond honey cakes why not pin it for later? Thanks for visiting Tin and Thyme. If you make these easy gingered pear almond honey cakes, I’d love to hear about it in the comments below or via social media. Do share photos on your preferred social media site and use the hashtag #tinandthyme, so I can spot them. For more delicious and nutritious recipes, follow me on Twitter, Facebook, Instagram or Pinterest. 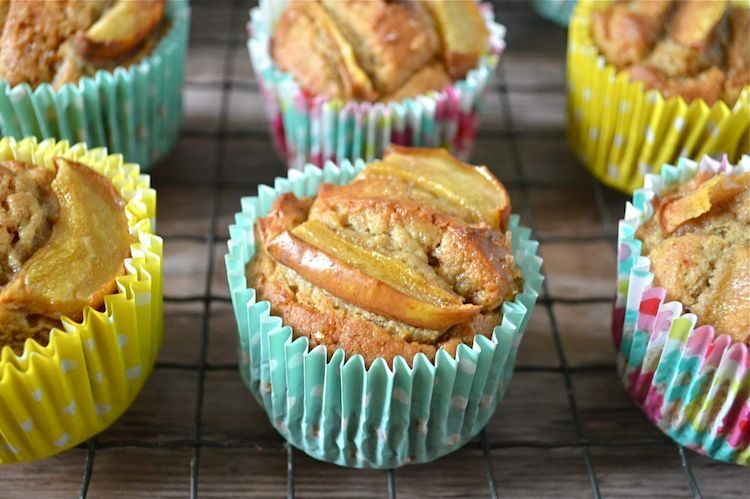 Easy to make almond cakes flavoured with pear and honey and a gentle amount of ginger. Portable and perfect for bonfire night and other autumnal gatherings. Grind the almonds in a blender or food processor (I used my Optimum G2.3). Add two of the pears along with the coconut oil and blend for a minute or two or until the pears are pureed. Add the honey and eggs and blend again until well mixed. Sift the dry ingredients into a bowl. Make a well in the centre, then pour in the nut batter and gently mix in stirring from the inside outwards. Stir in the crystallised ginger. Divide the mixture between 9 cupcake cases. Thinly slice the remaining pear and arrange on top of the cakes. Sprinkle a little of the sugar over each one. Bake at 180℃ for 20 minutes or until the cakes are well risen and a skewer inserted comes out clean. Great cakes for eating around the fire on Bonfire Night. They are fantastic, Choclette. I love that you made this low fat, low sugar and low calories..absolutely my kind of tea time treat. What a lovely combination of ingredients. I am sure the cakes would have tasted amazing. A fantastic seasonal bake. Pears are so delicious with honey and almonds, love the slices of pear on top of the cakes. Yes, they’d have looked a bit boring without the pears I reckon. What a lovely treat for bonfire night. I love baking with pears they add a lovely flavour to cakes. Thanks Jemma. Pears give quite a gentle flavour, but a good one. Well that was a CTism, he’s even more anti than me. But I love Bonfire night. I’ll let you have one or two of these for Halloween though, just because I love you Dom. Perfect autumnal baking, these sound so good – I bet they smell amazing! They were amazingly good considering they were a by product of a mistake. They look really delicious Choclette! 😀 Love the flavour combination. Thanks Nadia. I was quite pleased with them, especially as I’d no intention of baking at all when I started. Pear, ginger and almond? I bet these taste incredible. They certainly look like they do! They only came about because I couldn’t manage to make nut butter Aimee, but I don’t regret it, they were delicious. Like you I love ginger in cakes and these look so delicious. My mouth is watering just looking at them! It wouldn’t be Bonfire Night around here without some sort of ginger treat and these look just perfect! Thanks also for mentioning my Pear & Pecan Cake aswell as joining in with #BakeoftheWeek – Great to have you on board. Thanks Helen. I’d join in more often if I could but remember! These would be perfect for my morning coffee – I could pop a few straight in!! Oh the flavours in these sound absolutely divine. Ginger, pear, almond AND honey?! Just gorgeous!! Thanks Becca. Autumn is such a good excuse for making lots of delicious bakes and comfort food. These look delicious! Thank you for entering #TeaTimeTreats! I like cakes but not when they’re too sweet, so these sound great for me! Yay! Unless I know I’m in for a really sweet hit, like fudge, I prefer to taste the flavours of my cakes and biscuits and not be overwhelmed with sugar.